The AV122C2 is the fastest model we offer in the AV100 series, with scanning speeds of 25 ppm or 50 ipm at 200 dpi in color mode. With its slender build, the AV122C2 is ideal for those who want compact office equipment without sacrificing performance. The AV122C2 delivers fast scan rates of 25 pages per minutes in simplex mode and 50 images per minutes in duplex mode at 200 dpi in color mode, providing a truly breathtaking digitalizing experience. The AV122C2 measures only 308mm x 156mm x 145mm. With its slender build, the AV122C2 is ideal for those who want compact office equipment without sacrificing performance. 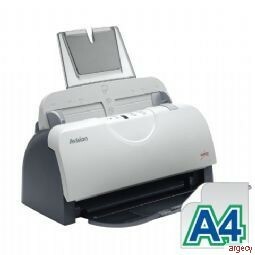 With a 50-page auto document feeder, the AV122C2 is able to scan document continuoulsy without interruption. The Avision AV122C2 scanner comes with TWAIN and ISIS drivers, exclusive Avision Button Manager, AVScan, and PaperPort 14SE.